Fall in love with the Denim Jacket from Liverpool. This gorgeous piece is perfect for layering on the weekend. This jacket is beautifully soft with just enough stretch to hold its shape, while still being comfortable. Great jacket. Semi-fitted and goes great over just about anything. Great to wear as a casual piece, but just a little classy too. Looking for a denim jacket for a while now. So glad I came across this jacket. Its soft, stretchy and fits just right. Looks great on too!! Nice jacket but I sized up to have plenty of room only to find it was too tight across the arms, was quite a small fit in general and the sleeves were way too long. Had to return. I love this jacket. Not too heavy and fits well. Nicely tailored. Looks good over a dress. This is a ripper. Totally forgiving if you've had too much dinner - the elasticity adapts to your shape and is very flattering. I've been on the look out for a denim jacket for a while & this one ticks all the boxes. 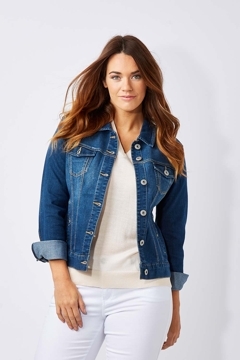 Enough give in the denim to stop it looking boxie & stiff, great length, sitting just on the hip & very comfortable to wear. I will get a lot of wear out of this item. Sensational jacket . Great cut , colour and fit . A must have !! Very nice feel and stretch, but the Large size almost didn't meet at the hips (I am size 14), while being almost too big at shoulders. I lîked the look and feel of thus jacket, but the XL was a very snug fit and so I returned it. Love this jacket. Great colour and fit. Stretchy denim so it's not restricting like other denim jackets I've had. Nice shape too, not boxy. Looks great with pants and dresses/skirts. Great denim jacket. Good stretch and ideal to dress up or down. Sits on waist, I'm 175cm, fabric stretchy and the top stitching quite bright. Very happy, slightly younger cut than my usual Sportscraft denim jacket. Great jacket - wear it all the time. Great colour but not for me. I'm a size 12DD and this jacket didn't do up at the front. Returning it. I've been looking for a denim jacket for some time and finally found one which looked a bit longer than most. It is all that I hoped for - great cut, just the right length and lovely fabric with just a bit of give, which makes it so comfortable to wear. I bought the L - normally a size 14. Thanks for the great service! This is a very well fitting jacket. It has a good shape and is flattering. However, I feel the buttons are a little on the large side. Great service and great quality. I especially love the personal hand written notes. Always prompt delivery. Sizing is generous. I'm normally a 10 and went for M so I can wear jumpers inside it. The shape is very flattering - it's fitted rather than boxy and it is a very good length - not too short. Fabric is very soft and stretchy and it feels and looks like a high quality garment - this was a great buy and I will wear it for many seasons. Lovely jacket, lots of compliments when I wear it. Looks so great on. I've wanted a dark demin jacket for ages. This is a perfect fit! This jacket has the just right amount of stretch in it to make it really comfortable. Extremely happy.